Santorini is connected to Milos with daily ferry itineraries during the summer season. The distance between the two islands is approximately 85 nautical miles and the journey can last from 2 hours and 30 minutes to almost 6 hours, which mainly depends on the ferry operator. Ticket prices for passengers range from € 20 to € 50. How long is the ferry ride from Santorini to Milos? The duration of the trip from Santorini to Milos ranges from 2 h 30 minutes to almost 6 hours, depending on the ferry being either a high-speed or a conventional one. Ferry tickets from Santorini to Milos cost from 20 to 50 euros, depending on the ferry operator. Concerning the vehicles, a car ticket costs around 50 euros and the motorbike ticket is equal to 12 euros. The distance between Santorini and Milos is about 136 km or 85 nautical miles. Which port of Santorini do I depart from? Santorini (or Thira) has only one port that serves passenger ferries. The name of this port is Athinios and it is located on the middle-west side of the island. The port of Milos, called Adamas, is very close to Chora. If you visit Milos only for a day, be sure to rent a vehicle, to explore as much as possible. There are many other beautiful islands around Santorini that you can visi as well, such as Paros, Naxos, Amorgos, Koufonisia and Ios. 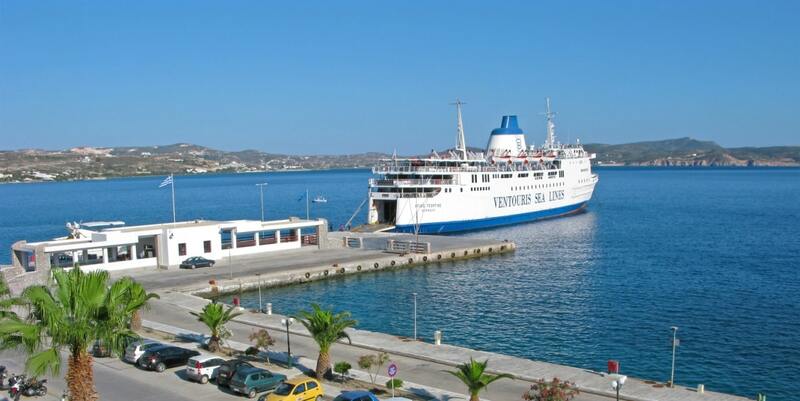 You can also check other ferry routes from Santorini to Mykonos, to Paros, to Heraklion and to Naxos. Island hopping around Santorini is the best! You can check our Ferry Map for more ideas!